The happy face of winter, Pansies are easy to grow from both seeds and seedlings. They flower in the cooler months and add great colour to the garden from autumn through to spring. Often thought of short as lived, Pansies are actually a fairly hardy annual plant that flower in winter. They can even be grown as a perennial in the right climate. And although they be seen as slightly ‘Old Fashioned’, you will find them growing in pots and containers on balconies and verandahs even in the inner city. Most gardeners will simply buy a tray or pot of pansies rather than worry about growing from seed. However they are easy to grow from seed. So here are our top tips for growing pansies. Growing Pansies from seed is easy, they will take around 3 – 4 weeks to germinate and will be ready for planting out 4 weeks after that. These are a cool season plant so seed sowing will vary depending on the climate zone. You can plant the seeds in spring, or in autumn to early winter. In frost prone zones, plant the seeds 8 – 10 weeks before the last frosts and transplant outdoors after the danger of frosts is over. We like to sow the seed into trays this helps to keep them away from slugs and snails. The seeds are small and need to planted near the surface. Use a good quality potting mix with the top layer sieved. Spread the seeds as evenly as possible. Lightly water in with a misting spray and then sieve a light layer of potting soil over the top. Keep the seeds moist, yet not wet. As they germinate, wait until they have 4 leaves and them thin them out (prick out). Propagation can be speeded up by using a heated propagation tray or cold frame in the cooler months. When planting out into the garden or container plant them at around 1o cm (4 inches) apart, half of this in a container . Choose a sunny position and a humus rich, well drained soil. Water in with a liquid seaweed fertiliser. We generally pinch out the first flowers, this promotes bigger flowers and bushier growth. It is also best to dead head the plants (remove the old flower heads) this promotes more flowers. In the garden, dig in lots of well rotted compost before planting. In a container, use a good quality potting mix. Water the pansy seedlings in the pot they can in before planting. Carefully break them out of the tray and carefully divide them. Plant them about 10 cm apart in the garden, 5 cm apart in a container. Keep moist but well drained. Although they do not require a lot of fertiliser, they do appreciate some. We use a pelletised organic fertiliser after 4 weeks. And occasional applications liquid seaweed mix. 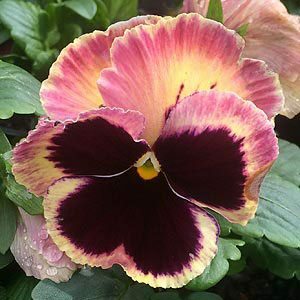 A wonderful annual bedding plant as well as a useful plant for containers or as a filler in the border, pansies are a cool climate plant and come to the fore in spring to summer with masses of colorful flowers. In some climates they will flower throughout the year, even in winter given a warmish spell. In the garden they prefer full sun in the morning and afternoon shade, as a general rule, the hotter the climate the more shade. Pansies do like a humus rich deep soil, well drained but moist. Pansies are usually sold as seedlings in nurseries and garden centers from autumn to late winter. In a mild climate this a great time to plant them as they will be ready to flower in early spring. They can also be grown from seed. The flower that we know as the Pansy are hybrids of the Viola family, so what is the difference? All pansies are violas, but not all violas are pansies. 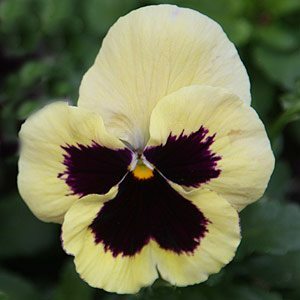 The distinguishing feature is the blotch on the flower, except that some commercial nurseries use the name pansy for all sorts of Viola hybrids. Colours range from white and yellows through to reds and purples and although the ‘blotch’ is always darker, this varies in colour as well. So lets look at how to grow them.